Separate your meat and vegetables with this three-tiered bento box. It’s created in the image of a kokeshi, a traditional wooden doll from Miyagi Prefecture. Its head doubles as a soup bowl and the rest of its body can hold cream stew, rice, broccoli or whatever else your heart desires. 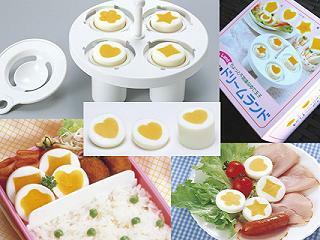 This is one of my favorite bento boxes because it’s microwavable and cute as a button. Few people will notice just how much food you’re scarfing down because they’ll be too enamored by the little girl you’re eating with. Here’s a school of animals ready to jump in your lunch box, feed you, and pick particles out of your teeth. What do you think…they’re toothpicks! Moms will rejoice that they can finally get kids to eat their brussel sprouts. Just stick in a toothpick and watch them eat it like a piece of candy (well, hopefully). It may seem deceptive, but it’s just like playing choo-choo train with a spoon. 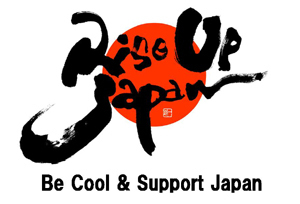 Japan has a way of transforming the mundane into something so awesomely cute. American toothpicks come in cinnamon flavor at best. In Japan, they’re transformed into a barnyard of happy animals, making everything all the more appetizing. A piece of broccoli is never as appetizing as when it’s smiling at you. That’s why when a Japanese mom needs to feed a stubborn kid, she starts by making faces. That is, she cuts out a pair of eyes and a mouth from cheese slices and puts them over a mound of vegetables. Food tastes best when it’s grinning from ear to ear. Japanese people call it ‘kyara-ben’ (character bentos), a lunch box filled with happy kids and chirping animals. Poke your chopsticks around and, lo and behold, it’s a bed of rice and chicken nuggets! The only choices here are happy, happier and happiest! But it’s always good to mix it up a bit, so choose wisely! Fill this pen up with ketchup, mustard, chocolate, or whatever else sits in your fridge. Use it to write down your kid’s name so that he’s the coolest student on campus. 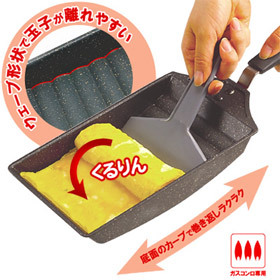 One of the most specialized cooking tools, this frying pan will make a thin sheet of egg you can use to cover a rice ball or clothe a quail egg. The best part is that it’s tasty, too! 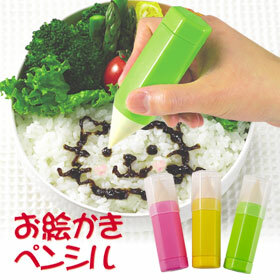 If you’d like to see cool bento creations, check out Anna the Red’s Bento Factory. You can find my favorite bento — a lunch in a box — at the train station. Believe it or not, it’s the best place to get a tasty meal. With so many people snatching boxes before a trip out of town, the lunchbox competition gets pretty heavy here. Bentos featuring cooked seasonal vegetables are some of my favorites. And now there’s a newfangled box that makes me want to fly out to Japan just to try it. It’s the self-heating lunch! Just pull a string and the box heats up like an oven. You’ll even see hot steam coming out! Here’s how it works: Underneath the food is a container of tiny white coals (calcium oxide). Pulling the string releases water which mixes with the coal, causing a chemical reaction. Specifically, CaO＋Ｈ2Ｏ→Ca(OH)2. Youtube has a bunch of home videos of tourists trying out these hot bentos, most containing slices of beef or cow tongue (it’s a delicacy!) over a bed of rice. Yum! ‘Smart’ is the way to go these days. With the ‘smart car’ it’s about fuel efficiency and park-ability. With the bento it’s about saving cash and making use of last night’s leftovers. Too many of us grew up with more food on the table than we knew what to do (thus, the invention of food fights). But with the economy gone kaput, the ‘smart’ ones can weather this storm just by packing their own lunch a few times a week. Believe me, it adds up. On average I blow $10 just on a sandwich. Meanwhile, Wednesday night’s chow mein is sitting there collecting mold specks in my fridge. 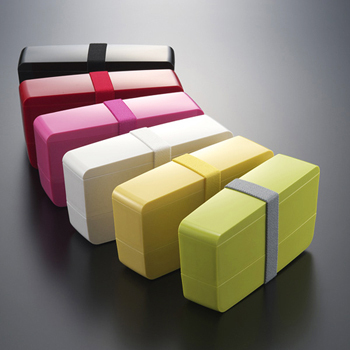 The Smart Bento is also neat because it doesn’t take an extra bag to carry it. And the top lid contains a pair of chopstick so you never have to go fishing for plastic forks among your drawer of soy sauce packs. You also get an elastic belt for keeping each anti-microbial compartment tightly shut and you can choose from red, green, yellow, white, pink or black — nearly all the colors of the rainbow! Lucky for us, now we can buy it from overseas. Check it out! What’s better than a Japanese bento? 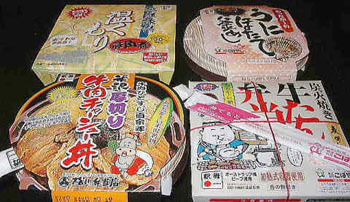 How about a Japanese bento 1.5 times its size? That’s what you’ll find stacked at train station kiosks these days. It’s part of the “mega” boom going on across the country where people are getting more for their hard-earned money. It’s an unlikely sales tactic in a country of skinny people, but during economic hard times even skinny people yearn for a bargain. In the U.S. it was McDonalds that pioneered the super-size menu. Now Japan has caught on with its Mega Mac — four patties and three buns — and the Mega Muffin, a monster breakfast sandwich stacked with two pork patties, two bacon strips, a slice of cheese and a poached egg. Americans haven’t even seen the likes of that one. Yikes! At restaurant chain Sukiya, they serve mega beef bowls with grilled onions and nearly half a pound of juicy meat. It’s 1,286 calories — over half the recommended daily intake — but priced at $6, I’d say it’s worth the artery cloggage. Of course, Yoshinoya has been the hungry-man champ for years with its ‘special large’ (tokumori) beef bowl. Late last year, one of its workers made a viral video showing someone piling the beef on like it was Sears Tower. They called it the ‘tera’ beef bowl. Hungry viewers flocked to the nearest Yoshinoya hoping to get one, though of course it was only a joke.